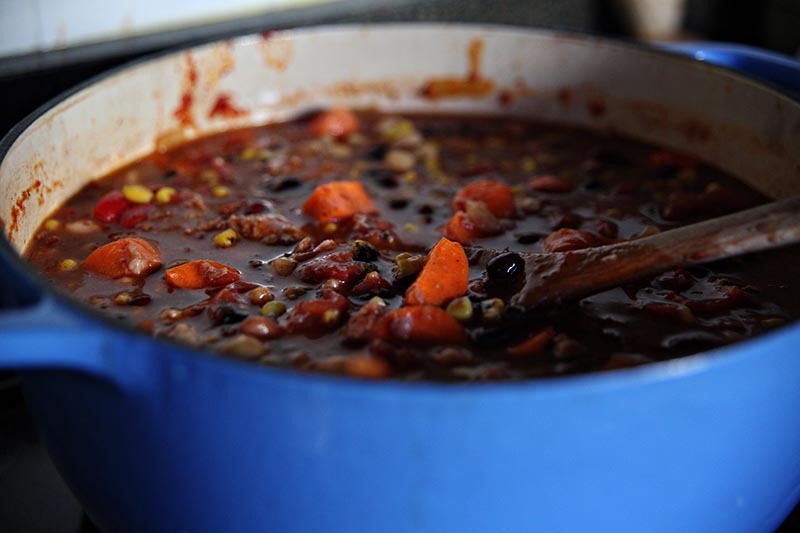 Growing up there were two kinds of winters- Brunswick stew winters and chili winters. Every year my dad would make an insanely large batch of one or the other (really, something like 40 quarts) and freeze it in batches big enough to feed our family of eight. 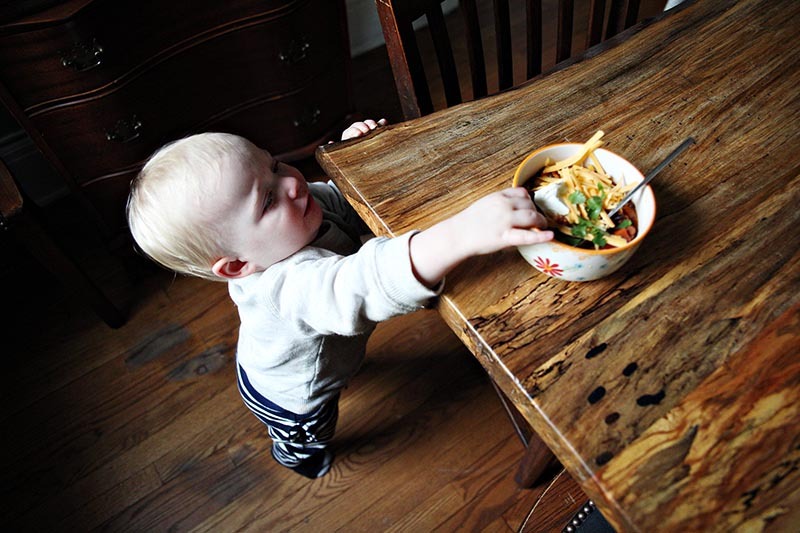 That way all winter long our bowls were full of something warm, nourishing, comforting, and delicious. This winter in my house has definitely been a chili winter. 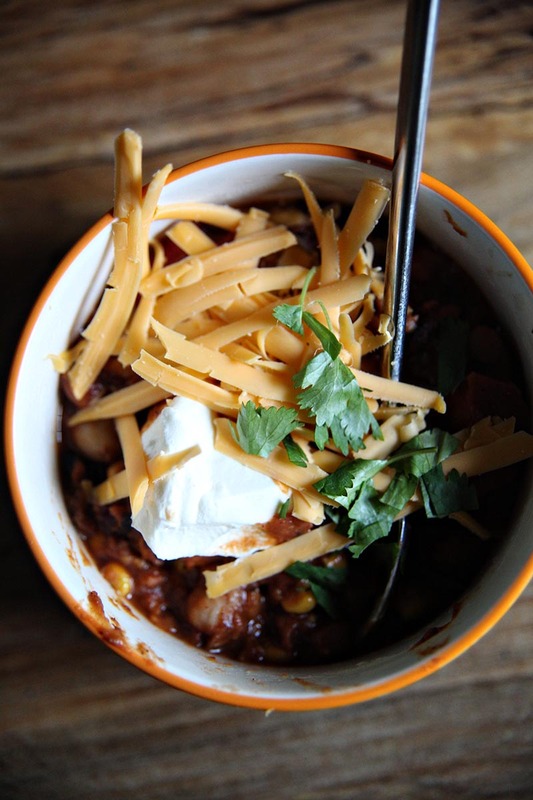 We may only be a month in to the season, but we’ve eaten chili no less than five times. And while I make it in five quart batches instead of forty, it is still being devoured with gusto. In fact, it appears as though Everett is a chili fiend. He can easily put away two adult sized portions, asking for more long after Dan and I are full. I vary the ingredients a little each time (Ev’s enthusiasm for it has lead me to include some veggies I wouldn’t normally put in chili) but the basic framework stays the same- five (or more!) varieties of beans, tomatoes, corn, onion, garlic, and lots of spice. Simmered, low and slow, for as many hours as it takes for your house to smell cozy. Served with sour cream, shredded cheese, green onions, cilantro, and hot sauce. It may seem silly for me to sit in my coastal Carolina kitchen and complain about the cold weather but honestly, I’m frozen solid and counting my blessings that I’ve got a pot of chili simmering on the stove. Mince onion and garlic and combine in Dutch oven with olive oil. Cook over medium heat until onions have begun to soften. Mix in tomato paste and stir well to coat. Cook, stirring constantly, for 1-2 minutes while the paste browns. Add meat to the pan and stir well to combine. Add spices and cook for 4-5 minutes until the meat has browned. Add the beans and their juices, one can at a time, stirring well as you add. Next add diced tomatoes, corn, and water. Stir well. Chop carrot and bell pepper and add to the pot. Allow the pot to come to a low boil and then reduce heat to a simmer. Cover partially with lid and simmer for 4-5 hours, stirring occasionally. Taste test and adjust salt and spices as needed. 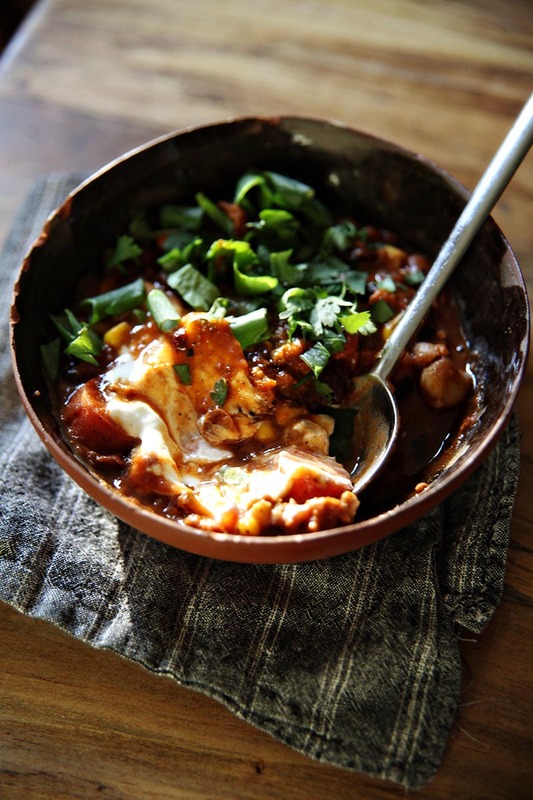 Serve hot with all your favorite chili toppings. YUM! Finally making this before it gets too cold to enjoy chili :) So TWO 102-oz cans of diced tomatoes? Or just one? It’s listed twice, but I wanted to be sure! Hey! That’s a total typo, just one can! Good catch!